A well-built, (or proudly-built;-), home provides comfortable living space in a variety of temperatures. Thanks to advanced building products, and correct use of such, the days of drafty rooms, and cold floors can be a thing of the past. Correct framing and insulation methods are vital to an energy efficient and comfortable home. Over-insulation, or tightly packed insulation is poor insulation. When using fiberglass insulation, the appropriate amount of insulation will fit gently into the area, without having to be compressed or forced into the area. While there should be no voids, there should also be no areas of dense, packed insulation. Packing insulation into an area decreases the R-value and can warp sheetrock and trim. A better insulation for doors and windows is a low-expansion foam. Foam insulation can be purchased from nearly any hardware store and is relatively inexpensive. Be sure to use low-expansion foam around doors and windows to avoid bowing or warping the extension jambs. Inspect and measure the thickness (inches) of any insulation in unfinished basement ceilings and walls, or above crawl spaces. If the crawl space isn’t ventilated, it may have insulation in the perimeter wall. If your house is relatively new, it may have been built with insulation outside the basement or foundationwalls. If so, the insulation in these spaces won’t be visible. The builder or the original homeowner might be able to tell you if exterior insulation was used. Windows are often the weak link in an otherwise well insulated home. Old windows are often single pane glass; allowing a lot of energy transfer and decreasing the energy efficiency of your home. New-construction or replacement windows offer double-pane, gas-filled sashes. Often, the energy efficiency of your home can be improved by installing new, energy efficient windows. Window choice has a real impact on heating and cooling costs. This chart is based on a computer model of heating costs for a 1,540-sq. ft. house with R-30 ceiling insulation and R-19 in the walls and floor. The window area is equal to 15% of the floor area. Convection is another way heat moves through windows. In a cold climate, heated indoor air rubs against the interior surface of window glass. The air cools, becomes more dense and drops toward the floor. As the stream of air drops, warm air rushes in to take its place at the glass surface. The cycle, a convective loop, is self-perpetuating. You recognize this movement as a cold draft and turn up the heat. Unfortunately, each 1°F increase in thermostat setting increases energy use 2%. Multiple panes of glass separated by low-conductance gas fillings and warm edge spacers, combined with thermally resistant frames, raise inboard glass temperatures, slow convection and improve comfort. Radiant transfer is the movement of heat as long-wave heat energy from a warmer body to a cooler body. Radiant transfer is the warm feeling on your face when you stand near a woodstove. Conversely, your face feels cool when it radiates its heat to a cold sheet of window glass. But radiant-heat loss is more than a perception. Clear glass absorbs heat and reradiates it outdoors. Radiant-heat loss through windows can be greatly reduced by placing low-E coatings on glass that reflect specific wavelengths of energy. In the same way, low-E coatings keep the summer heat out. Air leakage siphons about half of an average home’s heating and cooling energy to the outdoors. Air leakage through windows is responsible for much of this loss. Well-designed windows have durable weatherstripping and high-quality closing devices that effectively block air leakage. Hinged windows such as casements and awnings clamp more tightly against weatherstripping than do double-hung windows. But the difference is slight; well-made double hungs are acceptable. How well the individual pieces of the window unit are joined together also affects air leakage. Glass-to-frame, frame-to-frame and sash-to-frame connections must be tight. The technical specifications for windows list values for air leakage as cubic feet per minute per square foot of window. Look for windows with certified air-leakage rates of less than 0.30 cfm/ft2. Lowest values are best. Low-E glass reflects heat energy while admitting visible light. This keeps heat out during the summer and during the winter. In the winter, low-angle visible light passes into the house and is absorbed by the home’s interior. Vinyl windows have been around for 35 years. Vinyl is energy efficient, durable, rotproof, insectproof and weather resistant. It’s made with chemicals that inhibit UV-degradation. Vinyl is colored throughout and requires no painting. The knock on vinyl is that it fades, can’t be painted, becomes brittle with age and is thermally unstable (especially dark colors). Temperature changes cause it to contract and expand more than wood, aluminum and even the glass it holds. Vinyl frames have the potential for causing increased air leakage over time because of this movement. But Richard Walker, technical director of the American Architectural Manufacturers Association (AAMA, 1827 Walden Office Square, Suite 104, Schaumberg, IL 60173; 847-303-5664 ), is quick to say, “Vinyl windows are built with this movement in mind, and failures have not been recorded to cause concern.” If you choose vinyl frames, specify light colors and heat-welded corners. Heat-welded corners hold up best over time. The pigments that are used in paint are almost identical to those used in vinyl, but vinyl’s color goes all the way through. Walker says, “A little rubdown with Soft Scrub or one of the products on our (AAMA) list of recommended cleaners will bring vinyl back to its original brilliance.” I tried the Soft Scrub test and was impressed with how much brighter aged vinyl became. Not the original color, to be sure, but the scrubbing resulted in a marked improvement. Aluminum-frame windows are durable, requiring little maintenance. However, they are energy siphons and shouldn’t be used where energy efficiency is a consideration. The range of window options available today is staggering. But a working knowledge of the terms and these few guidelines should make choosing windows a little less intimidating (see Rules of thumb for window selection). You might also want to get ahold of this book: Residential Windows: A Guide to New Technologies and Energy Performance by John Carmody and others, W. W. Norton & Co. Inc. (1996). To get the best value from your windows, select units that match your climate. This chart suggests minimum values for the listed climates. Use a handheld infrared thermometer, available at home improvement stores, to take the temperature of the outside air. You’ll actually be taking the temperature of objects that are outside, according to the North Dakota State University Cooperative Extension. For example, take readings of porch chairs or garden stones by holding the thermometer up to the items. All of the items should measure the same as the outdoor air. Take the temperature of both the interior and exterior walls in an insulated room in your home, using your infrared thermometer. An interior wall is a wall in the room that backs against another room in the house while an exterior wall is a wall that provides a barrier between your house and the outdoors. An infrared thermometer gives you the most accurate reading of the ambient temperature when you hold it within 1 to 3 feet of the wall you’re measuring. If the temperature reading of the two walls differs by more than just a couple of degrees Fahrenheit, you probably could use more insulation in your home. Measure the thickness of existing insulation in your attic, basement or crawlspace. Use a regular tape measure to identify the thickness, in inches, of the existing insulation. 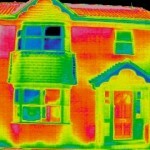 Identify the R-value of the insulation in your home. According to the U.S. Department of Energy, R-value stands for resistance to heat flow. Determine the R-value with the measurements taken and some simple math. If you’ve got pink, white or yellow fiberglass insulation, multiply your depth in inches by 2.5 for loose fibers or 3.2 for batts, or precut rolls. If you have gray, white or black-specked rock wool insulation, the R-value is your depth multiplied by 2.8. The results of your math is your R-value. Check what the recommended R-value is for the area in which you live. Energy Star, an agency of the U.S. Departments of Energy and the Environmental Protection Agency, lists recommended R-values according to climate zones on its website. Compare your recommended R-value with the actual R-value you find in your home to determine if your house needs more insulation. With winter on its way…it’s time to seal your home from the elements!